I wrote the following text for the MECO research group 360 project. The project offers a space for members of the network to connect disciplinary and environmental concerns through short experimental texts. I was trying to think through the question of the place of art history in thinking about planetary failures such as the destruction of the Arctic flyways. It seemed a long stretch to force a connection between godwits and art history – except that the critical skills of art history have enabled me to develop an ethos through which I can do just this. The space of writing and thinking about contemporary art is a space of writing and thinking about the planet, rather than one being an illustration of the other, they are intimately connected. This year I saw only 13 godwits feeding at Collingwood, I hoped it was just because I arrived early this year. New Zealand’s ‘2015 bird of the year’ is struggling. Travelling from Alaska to the Antipodes across the central Pacific Ocean, the Bar-tailed Godwit flies one of the longest known animal migration corridors on this planet. 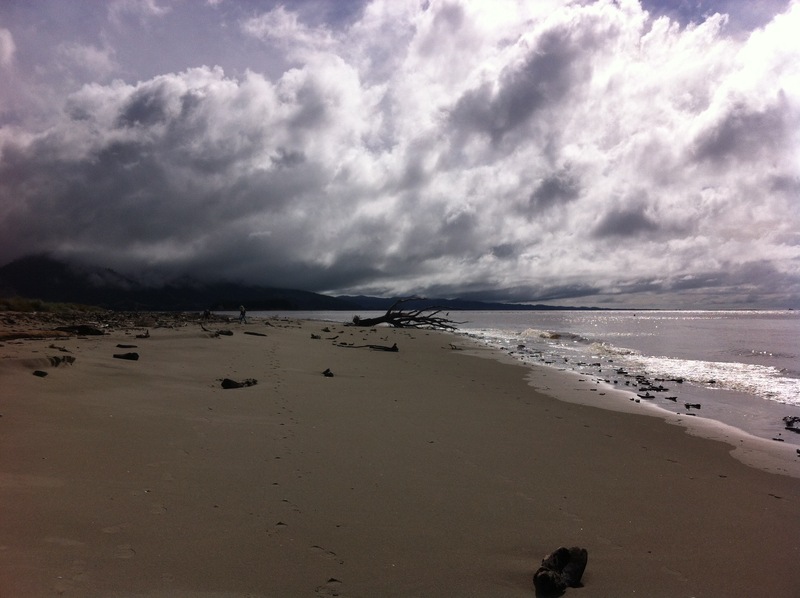 In New Zealand and Australia people greet the godwits on the beaches and estuaries. With calibrated ritual they count and measure. They walk around their twitchy gatherings, and wonder at their slender bodies that seem to contain so much energy. After resting in New Zealand, Australia and Fiji the birds return to Alaska to breed via the Yellow Sea. But each year less and less birds seem to arrive in these southern lands. Bar-tailed Godwits are suffering because coastal mudflats are being drained for the massive expansion of sea walls in China and Korea.⁠ In these areas and across the earth mangroves have been reduced by fifty percent. The push and pull of blame and responsibility is ongoing. National borders don’t help. Alison Russell-French sums it up: “As global travellers, shorebirds need a global community of caring humans.”⁠ New Zealand goes begging to China for a small piece of land to be conserved, just enough for the godwits to grab some polychaeta on their 11,000 kilometre journey north. And agreements are signed. To clean the shoreline of the Yellow Sea and return just a portion of it to a soft shore of wetlands we need machines. These include huge diesel guzzlers that move and level the earth, and other machines that use biological and chemical materials to remove heavy metals and purify the soil and water. The umwelt of the godwit covers an 11,000 kilometre radius, it is more than I can imagine but I cannot choose to ignore it. The story is one of interspecies and machinic relationships propelled by humans. 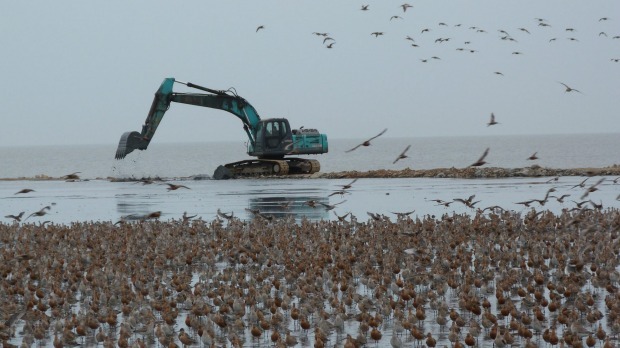 Industrial machines might have triggered the great acceleration of habitat loss but other machines help us understand the fate of the godwits today. These include the networked satellites that in 2007 proved the godwits’ extraordinary endurance when nine birds were tagged in New Zealand and tracked to the Yellow Sea by satellites orbiting above them. The same year another team of godwits left the coastal wetlands of the Yukon-Kuskokwim Delta in Alaska carrying solar powered satellite tracking devices on their journey south.⁠ I wondered if the added weight of their satellite units meant they had to rest longer, or fly slower, or if other travelling birds gave them a wide berth. It is just one small narrative among many. To take Spivak’s planetarities seriously means working within a practice of art history that includes birds, humans and machines; they all contribute to art’s histories. It also means shifting the boundaries of our disciplines in order to embrace a relational ethics—which many others have called an ethico-aesthetics—where my wanderings on a beach 11,000 kilometres from anywhere are informed by a broader range of bodies and things than at first appear. The godwit is just one small body travelling the earth system and it is best we pay attention.